How much money does a Production Engineer make in United States? A person working as a Production Engineer in United States typically earns around 6,428 USD per month. This is the average monthly salary including housing, transport, and other benefits. Production Engineer salaries may differ drasticlty based on experience, skills, gender, or location. Below you will find detialed breakdown based on many different criteria. Production Engineer salaries in United States range between 2,893 USD per month (minimum salary) to 9,642 USD per month (maximum salary). The median salary is 6,428 USD per month, which means that half (50%) of people working as Production Engineer are earning less than 6,428 USD while the other half are earning more than 6,428 USD. The median represents the middle salary value. Generally speaking, you would want to be on the right side of the graph with the group earning more than the median salary. Closely related to the median are two values: the 25th and the 75th percentiles. Reading from the salary distribution diagram, 25% of people working as Production Engineer are earning less than 4,194 USD while 75% of them are earning more than 4,194 USD. Also from the diagram, 75% of people working as Production Engineer are earning less than 8,035 USD while 25% are earning more than 8,035 USD. Experience level is the most important factor in determining your salary. Naturally the more years of experience the higher your wage. 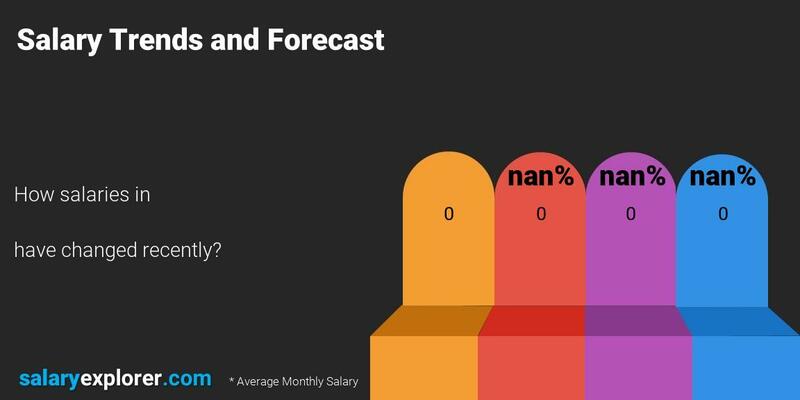 We broke down Production Engineer salaries by experience level. A Production Engineer with less than two years of experience makes approximatly 3,534 USD per month. While someone with experience level between two and five years is expected to earn 4,783 USD per month, 35% more than someone with less than two year's experience. Moving forward, an experience level between five and ten years lands a salary of 5,728 USD per month, 20% more than a person with two to five years of experience. 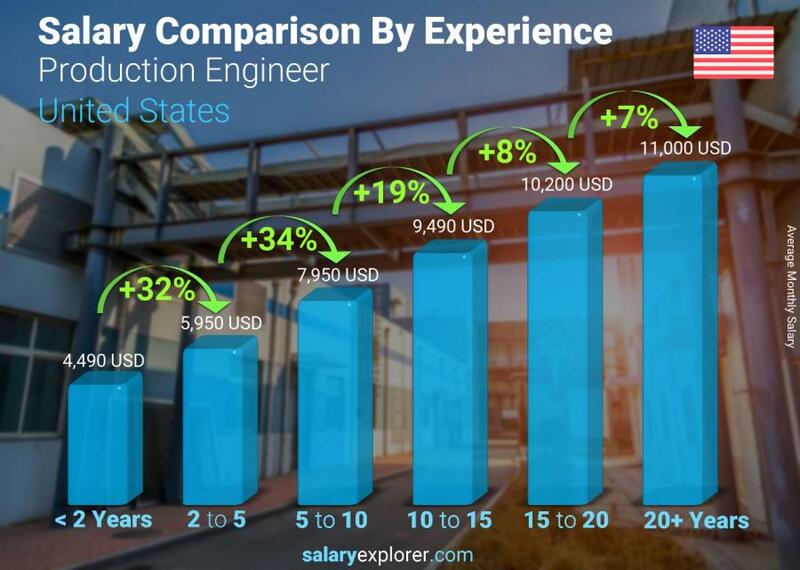 Additionally, Production Engineer(s) whose expertise span anywhere between ten and fifteen years get a salary equivalent to 6,672 USD per month, 16% more than a person with five to ten years of experience. If the experience level is between fifteen and twenty years, then the expected wage is 7,617 USD per month, 14% more than a person with ten to fifteen years of experience. Lastly, employees with more than twenty years of professional experience get a salary of 9,102 USD per month, 19% more than people with fifteen to twenty years of experience. We all know that higher education equals a bigger salary, but how much more money can a degree add into your income? 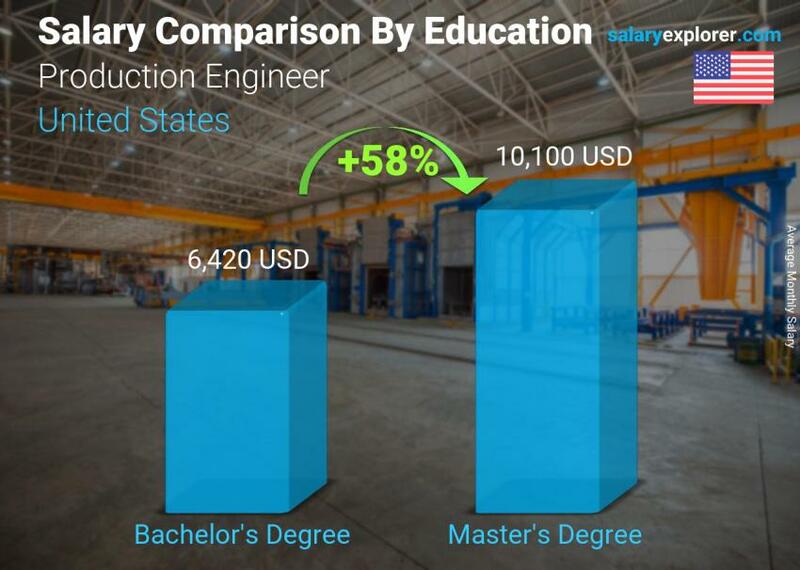 We broke down Production Engineer salaries by education level in order to make a comparison. When the education level is Certificate or Diploma, the average salary of a Production Engineer is 4,816 USD per month. While someone with a Bachelor's Degree gets a salary of 6,605 USD per month, 37% more than someone with Certificate or Diploma. A Master's Degree gets its holder an average salary of 8,461 USD per month, 28% more than someone with Bachelor's Degree. Though gender should not have an effect on pay, in reality it does. So who gets paid more: men or women? Male Production Engineer employees in United States earn 12% more than their female counterparts. Where can you get paid more, working for a private company or for the goverment? 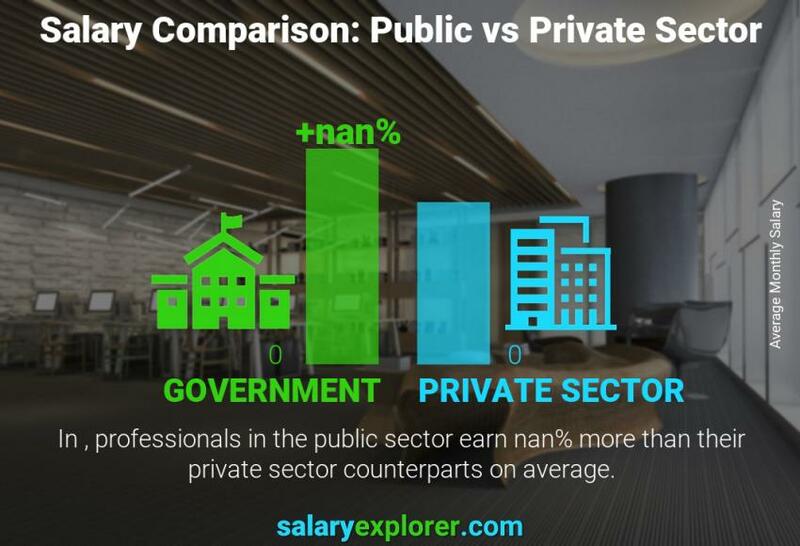 Public sector Production Engineer employees in United States earn 24% more than their private sector counterparts. How are Production Engineer salaries changing over time? Listed below is a chart that shows the average salary in recent years. 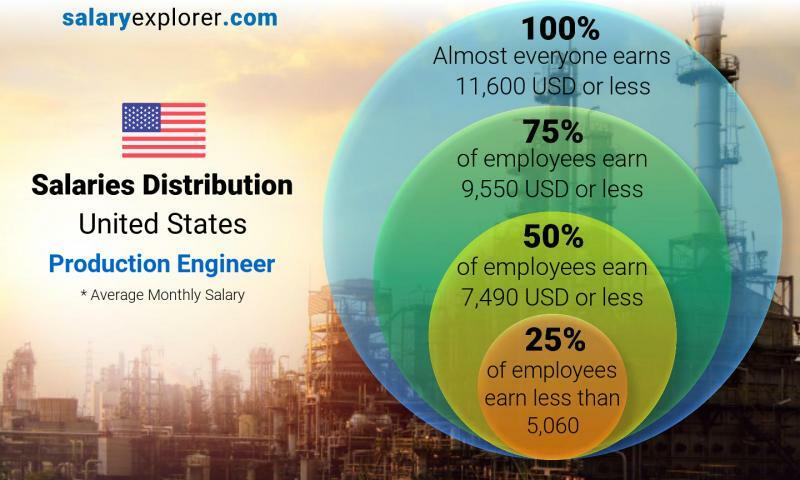 Production Engineer salaries in United States are on the rise in the year 2019 based on recent submitted salaries and reports. As displayed in the chart, salaries in 2019 are 1% higher than those of 2018. The trend suggests a slow yet continous increase in pay in 2020 and future years. These numbers differ slightly from industry to another. The average hourly wage (pay per hour) in United States for Production Engineer is 37 USD. This means that the average Production Engineer in United States earns approximatly 37 USD for every worked hour. 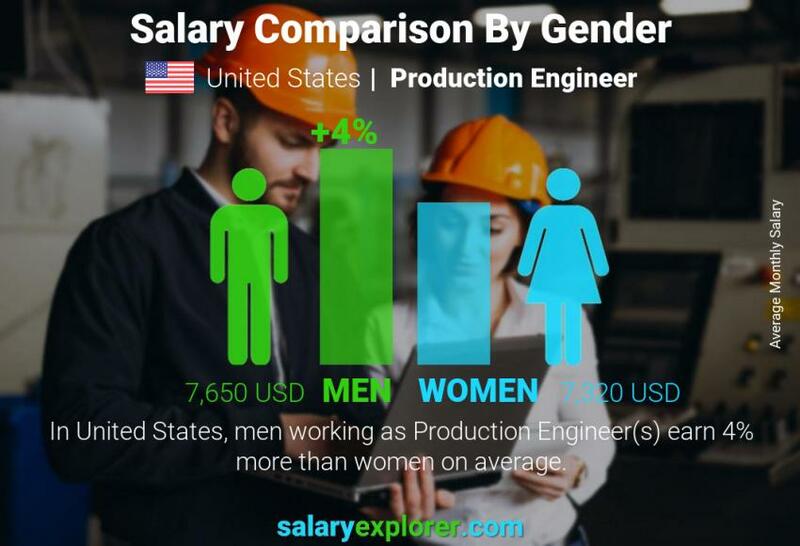 We compared United States salaries for Production Engineer, Factory and Manufacturing, and All Jobs and we found that Production Engineer salaries are 24% more than those of Factory and Manufacturing. We also found out that Factory and Manufacturing salaries are 22% less than those of All Jobs.